Chinese coin beads bring something a little different to beading projects. If you are looking to create something a little different, why not consider using Chinese coins for beading projects? Chinese artifacts have long been prized by people looking to create unique and interesting jewelry. The long history of China, combined with the symbolism which is prevalent in many Chinese beads and accessories, makes these coins a fascinating choice for the creative jeweler. 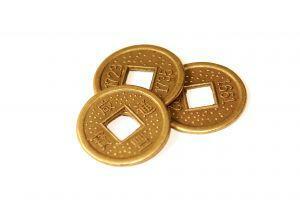 Chinese coin beads are becoming increasingly popular and are available in a variety of styles, shapes and sizes. As there are over 30,000 different types of Chinese coins, stretching back over 3,000 years, there is a wide range of coins to chose from! The coins were traditionally made from bronze. They are round with a square hole in the center and a rim at the edge. When this unique shaping is reflected in beads, many opportunities for creative designs open up. Chinese coin beads are typically replicas of real antique coins. These small metal discs are generally brass colored, and are used as charms. The beads are often antiqued to give an earthy finish. It is possible to buy genuine antique Chinese beads, although these are generally available from antique markets and stores rather than craft supplies. Some of the beads have been cast with jump rings attached to the top, making them suitable for hanging from bracelets, necklaces and earrings. Other beads are exact replicas of the coins and are simply a disc with a square hole in the middle. The beads range in size from small discs of less than 1/2 inch across, to larger discs which are over 1 1/2 inches across. Chinese coin beads are great for a variety of beading projects. They can be used as accents, as feature beads or incorporated into more complex designs. The coin beads can be used with other materials, such as beads made out of gemstones or glass. The antique and earthy feel of the brass colored metal is complemented by turquoise. Turquoise is readily available from beading stores in a variety of shapes and sizes. Many stores sell turquoise 'nuggets' which are uneven pieces of the gemstone and are often roughly polished. These can complement perfectly the evenness of the coin bead. Another option to consider is Chinese jade. Chinese jade is available in colors ranging from pale greens to much darker hues. Jade is also commonly carved into shapes which lend themselves to a Chinese-inspired jewelry set. The Chinese coin beads that are sold complete with a jump ring can simply be hung or fixed using another jump ring. These can add some interest to other beads and make unusual charms for bracelets. A bracelet could be made featuring only Chinese coin beads of different shapes and sizes, or a few could be incorporated into a bracelet made of other materials. Other coin beads without the addition of a jump ring can be incorporated into jewelry in a variety of ways. Wire wrap artists rise to the challenge that this brings and make some wonderful items of jewelry by twisting the wire in and out of the central square hole, before attaching this to ear wires or a pendant. You may also want to consider using Chinese silk to string your beads. This can provide an excellent finishing touch to a Chinese-inspired piece, as well as being hard wearing. FireMountainGems.com has a wide range of beads and supplies, including many different types of Chinese coin beads. ShipWreckBeads.com offers a large selection of beads, including a few coin beads. Check the material content carefully. Some cheap beads from unknown sources may be made of base metals containing nickel. Consider using real antique coins for special projects. These unique accents can bring an additional romance to the finished piece. Look for stores offering good deals on bulk purchases. It is surprising how many beads can be incorporated into a single item of jewelry!